discussion, silk painting. Preparation of prefelts plus sample layout for main project. Day 3: Felt and Form: wool layout, design work, prefelt additions. stitching for design emphasis, review of techniques. Description – Patterns occur in the form of multiple repetitive elements. They grow smaller, larger, change their vertical or horizontal positioning, and they are all connected to each other and are codependent. It’s interesting how we come across these patterns everywhere in nature – in seed pods, blossom clusters, reptile skins, fish scales and much more. This class is introducing a unique and innovative approach to the structure felt fabric structure. 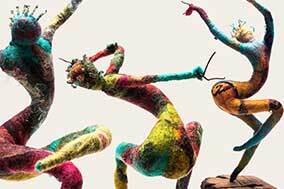 Participants will construct intricate felted fabric connecting pre-made elements and motifs, explore and understand the use of fibers other than wool, and learn how the inclusion of plant fiber helps to sculpt gorgeous three-dimensional surfaces. 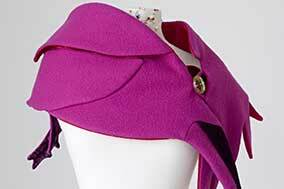 Students will learn a creative structural method applicable to any felt projects, including accessories, garments, interior design pieces, or fine art, and then create an elegant garment from multiple modules. On an average size felting space, without reaching, bending and standing all day long, we will assemble the pre-made parts in one of a kind individually designed wearable art piece, using Katia’s couture templates. It’s a process of construction, deconstruction, and application of innovative structural techniques. 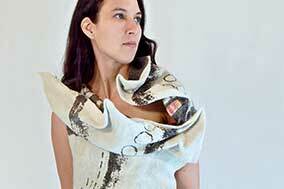 You will not only learn several new techniques but create a head-turning wrap, hooded scarf, or a vest. 2-D artwork with a complex composition and application of the newly-learned techniques is also an option. Description – Students will nurture the seed of creativity by honing skills of observation. Through guided exercises, readings and intuitive interaction with a variety of materials, participants develop a narrative from personal experience and study their working patterns and creative tendencies to incorporate into their art practice. Over time they can discover their authentic style and develop truly original work. Group discussion. Day 1: Journal Practice which includes note taking, exploring words, non-judgmental writing, experimentation with alternative tools and materials, intuitive drawing, collage, printing. Day 2: Meditative Stitching Practice by beginning a series of small, ‘linked’ stitch compositions. Students will study the objective characteristics of these pieces, consider composition and color tendencies that bring insight to working patterns. 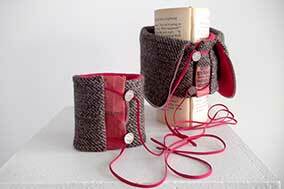 Individual pieces can be compiled into a small stitched book. Day 3: Reflecting upon and Recording conceptual discoveries as well as narrative, historical/cultural associations. the symbolism in archetypes and icons. Incorporate artifacts and embellishments. Employ limits as a means to expanding ideas. Develop Stitch/Technique ‘alphabets’ in a larger stitched piece. Description – During the first two days of this workshop, we will explore detailing and finishing techniques, such as closures, buttonholes, cutouts, edges, applique, embroidery and beading. The third day is dedicated to the felting of a wool yardage. 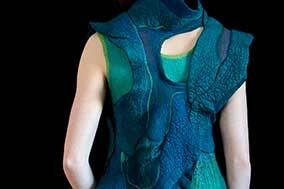 Into this yardage we will integrate lace, silk, collected materials and found objects. Final wet felting and fulling to complete the shape and a smooth ‘skin’. Description – In this intensive Rio will introduce you to a process she developed in 2008, called Composting. 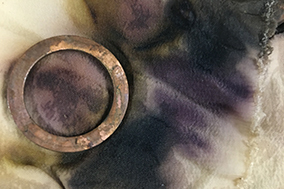 This technique uses harvested plants in combination with rust, immersion dyeing and concentrated extracts to create pattern and colors that speak from the essence of the plant. We will create dye baths with the plants she has collected from harvest and extracts such as cochineal and Osage Orange. Together we will explore the area and collect what we can find as well. These baths will be used to under dye and over dye the work we create together. By using the fresh, or dried dyestuffs to directly incorporate into our work samples you will discover various results. Rio will introduce shibori methods that will be used for creating pattern and we will make several small bundles for samples and eventually larger bundles for a final piece. There will be discussion on harvesting and working with the cycle of the seasons to create work as well as the environmental benefits of working with this process. With a little heat, time and precious plant tissues you will unlock stories of natural color. Description – Using a variety of materials in innovative applications, students will experiment with fabric manipulation to begin a repertoire of techniques that reflect a favorite place or landscape . A 8×12” or larger sampler wall hanging is the goal. 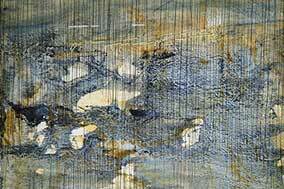 Process drawing and collage exercises will be used as a starting point for the work. The practice of capturing thoughts and ideas is encouraged for developing future work. 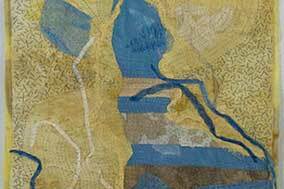 Day 1: Design a literal or abstract ‘landscape’ using collage that will translate into a stitched piece. Exploration of natural forms as references for texture. Discuss and demonstrate alternative ways of looking at materials and developing uses for them. Fabric manipulation techniques: fold, braid, tear, piece, weave, embellish, etc. ; Use mistakes and difficulties to ask questions and solve problems intuitively; Consider the purpose of the sketchbook as a ‘compost heap’ of ideas, story development; Begin the stitching process. Day 2: Continue working and discovering. Discussion of design elements and principles as compositions develop. Hanging alternatives. Description – This two day workshop is dedicated to the design, making of a pattern, cutting out, construction and finishing of a felted shawl, cuffs and collars in the shapes of gardens, flowers, tress, birds, fish, bears lions etc. to reflect the participants inspirations, ideas and interests. Participants bring their own felts we will transform these felts into sculptural shawls. Emphasis is on creativity, design and finishing of a wearable piece. 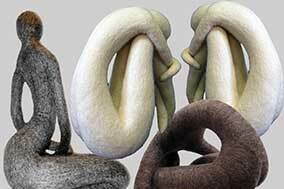 This is a 2-day workshop where you will learn to make a figurative sculpture using several felting techniques to create a unique sculpture. Your inspiration will be modern and contemporary dance that is full of emotion and outrageous movement. Wet felting and fulling to create the final shape and exaggerated movement. Description – In this intensive we will explore techniques developed by Rio and inspired by the ancient technique of Kalamakari . We will be using two basic elements to create a multitude of options for pattern and color shades. These elements are iron and tannin. We will create two iron baths from ferrous sulfate salts and one with rusty bits. We will also create several baths with tannins from sources like harvested plants and nuts to powdered extracts. Soy milk will be introduced as a resist and mordant that we will make from scratch. 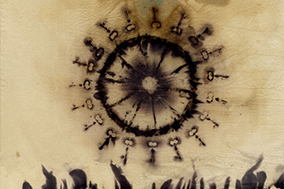 For pattern, Rio will demonstrate a few shibori methods and rust printing. You will walk away with many samples of silk, wool and linen with a final project from a large panel of silk.